We believe your software should not only manage your circulation, but help you grow it as well. That’s why our Smart Sampling™ tool is a built-in feature available to all Interlink Circulation customers. If you need to grow your subscription base, and as a side benefit, increase advertising revenue, Smart Sampling™ is the right tool to help you get the job done. Subscriptions have always been a newspaper’s most reliable source of revenue, and today, are the largest scale opportunity for growing immediate and recurring revenue. Smart Sampling™ recognizes that growth potential in every market by identifying non-subscribers in your primary ZIP codes so you can directly market to them without disrupting delivery quality for current subscribers. Traditional bulk saturation sampling simply can’t do that. You tell your community’s story better than anyone, and Smart Sampling makes it easy and inexpensive to help non-subscribers catch the habit your subscribers love. Take a look at the Smart Sampling brochure to discover how other publishers use Smart Sampling, and see how you can easily incorporate Smart Sampling into your current operations. We started using Smart Sampling™ a little over a year ago. It has been an excellent tool to target new subscribers. I would recommend Interlink and Smart Sampling™ to any newspaper. Traditional sampling of blanketing your area with non-labeled papers to both non-subscribers and your current subscribers once or twice a year probably isn’t cutting it for you. Interlink Circulation’s built-in Smart Sampling™, combined with purchased CDS addresses, lets you target non-subscribers along specific postal routes with the click of a button. That means non-subscribers can receive special offers and inserts with their sample papers while your subscribers continue to receive their usual labeled papers. Your sampling will be more focused and more effective. For publishers, subscriptions always have been a newspaper’s most reliable source of revenue, and today, are the largest scale opportunity for growing immediate and recurring revenue. Interlink’s Smart Sampling™ targets this growth potential in every market by identifying non-subscribers in your primary ZIP codes so you can directly market to them without disrupting delivery quality for current subscribers. Traditional bulk saturation sampling simply can’t do that. 1. 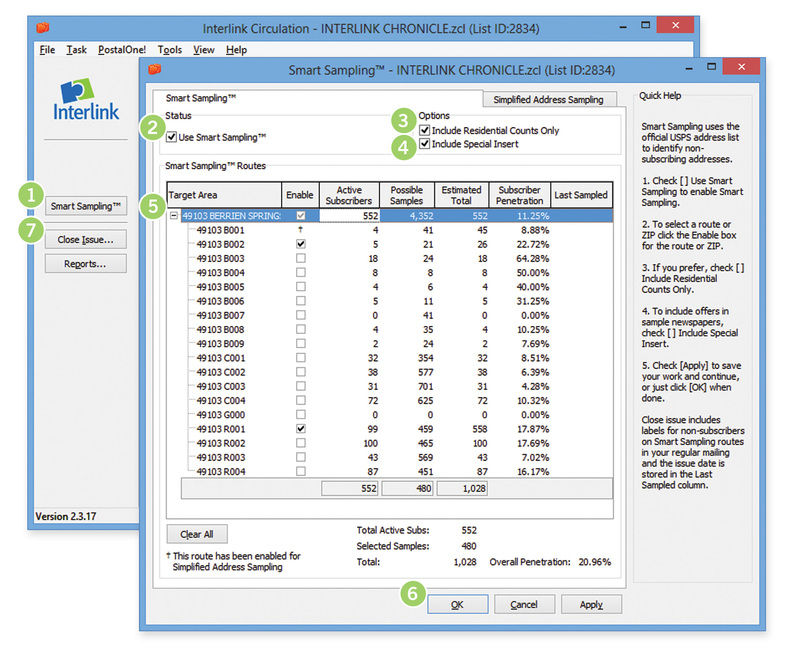 After the purchased addresses are attached to your list, click the ‘Smart Sampling™’ button on the left side of the open Interlink Circulation screen. 2. Check the ‘Use Smart Sampling™’ box to enable Smart Sampling. 3. If you want to only sample residential addresses, check ‘Include Residential Counts Only’. 4. If you plan to include a special offer or promotional insert in your sample newspapers, select ‘Include Special Insert’ as this will separate your sample subscribers from your paid subscribers. a. Click the ‘+’ sign next to the ZIP code to expand the selection and display the individual routes available. b. Check the box(es) for each route you want to sample*. *Once all desired routes have been selected, view the ‘Selected Samples’ total at the bottom of the screen to confirm it meets your expectations. 6. When setup is complete, click the OK button at the bottom of the dialog box. *Once Close Issue has been completed, please print your Statistics Report before you print labels to confirm the mailed copies number has increased as expected. Until you change your Smart Sampling™ selections, subsequent issues will automatically include sampled copies. 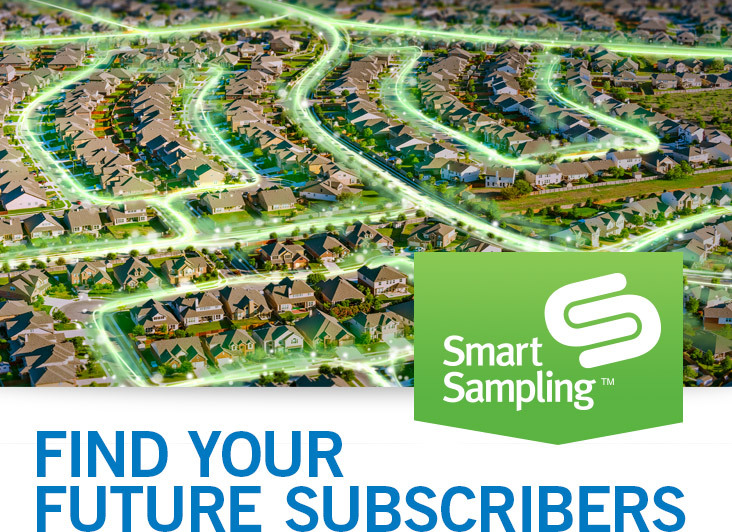 With Smart Sampling™, it has never been so easy or inexpensive to help non-subscribers catch the habit subscribers love. For more information about Smart Sampling™, CDS, or for pricing, please contact us. To view the number of possible addresses in your primary ZIP code(s), try our free Delivery Statistics tool. Simply enter the ZIP code, select ‘CDS’, and click ‘Search now!’ to view all possible routes and addresses. *CDS (Computerized Delivery Sequence) lists are official USPS-certified address lists of active and inactive addresses managed within each ZIP Code. CDS address lists allow you to distinguish between residential and business addresses so you target the addresses and routes you want.